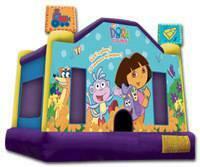 Come jump with Dora the Explorer and her best friend Boots in this great inflatable. Beware of Swiper. You don’t want him to steal the fun from your party. C’mon Vamanos!!! Order this hot new item today!